Gov. Larry Hogan speaks with reporters on the last day of the 2018 General Assembly session. Speaking at a press conference, Hogan accused lawmakers of trying to pass $31 billion in new spending without plans for how to pay for it. 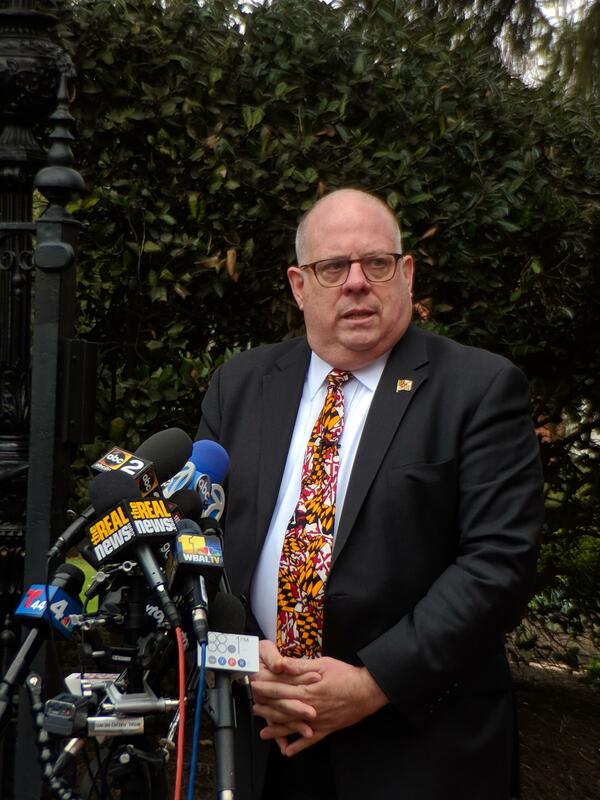 “Paying for these proposals would require a 33-percent increase in the sales tax, a 15-percent increase in the personal income tax or a staggering 200-percent increase in the property tax,” Hogan said. It’s not clear where the $31-billion figure comes from. Hogan said it’s the sum of all proposed spending increases so far this session, though it’s unlikely all of those proposals will pass. Hogan singled out legislation that proposes broad changes to education policy. The bill is based on recommendations by the state Commission on Innovation and Excellence in Education, nicknamed the “Kirwan Commission.” It calls for $325 million in the coming fiscal year and another $750 million the year after that. “Marylanders want better outcomes for our kids, but they’re also demanding that local school administrators are accountable for the billions in state tax dollars that we are handing over to them,” Hogan said. The bill, which is backed by Democratic leaders, lacks safeguards to ensure that local school systems are using the money as intended, Hogan said. But he stopped short of promising to veto the bill if it reaches his desk. But there are accountability measures in the legislation, said Baltimore Del. Maggie McIntosh, chairwoman of the House Appropriations Committee, one of the committees considering the legislation. McIntosh also sits on the Kirwan Commission. She said the commission recommended creating an organization outside of the State Department of Education to oversee implementation of the policies and use of the funding. None of the committees considering the bill have released their recommended versions. As for how the state would pay for the proposals, McIntosh said the $325 million needed for the coming fiscal year are covered in the current budget without any new taxes, and legislators are still brainstorming ways to pay for the policy changes in later years. Hogan also criticized a proposal to gradually raise the minimum wage to $15 an hour by the year 2025. “It’s estimated that this action would result in the elimination of 99,000 jobs for the very people who desperately need them the most and a loss of more than $61 billion over the next decade,” he said. But Senate President Mike Miller said minimum wage increases in New York and on the West Coast prove Hogan wrong. Both the House and the Senate have already passed the bill. The Senate amended it to increase the minimum wage more slowly for businesses with fewer than 15 employees. Representatives of each chamber are in the process of negotiating a final version. Hogan also had harsh words for the legislature’s decision making on criminal justice issues, such as the decisions not to advance Hogan’s proposal to increase mandatory minimum sentences for repeat offenses involving the use of a gun or a bill that would have allowed police officers to carry guns inside Baltimore schools. “This seems to be like the most pro-criminal group of legislators I’ve ever seen,” he said. A bill increasing Maryland’s minimum wage passed the state Senate along party lines Thursday with enough Democratic votes to override a potential veto by Gov. Larry Hogan. The legislation would gradually raise the wage to $15 an hour by January 2025 for most businesses. The Maryland General Assembly is on the verge of passing a $15 minimum wage. The House of Delegates approved it two weeks ago, and on Wednesday night, the state Senate gave the bill preliminary approval. WYPR's State Politics Reporter Rachel Baye speaks with Nathan Sterner to take a closer look at the proposal. Maryland elected officials are fighting over who should decide academic calendars for public schools. Gov. Larry Hogan in 2016 signed an executive order requiring schools to start after Labor Day and end by June 15. He is now trying to write that change into the state code, while the Senate gave initial approval on Thursday to a bill reversing Hogan’s order. Members of the Maryland General Assembly are rushing to meet a legislative deadline Monday, which is known as Crossover Day in Annapolis. Any bills that have not passed in one chamber and “crossed over” to the other by the end of the day will face an additional hurdle and are less likely to become law this year. This is the latest on some of the issues lawmakers are grappling with this year. Twenty-four years ago, a judge ordered fundamental changes to the way Baltimore City Public Schools are managed and funded. The ruling, the result of a 1994 lawsuit, led to Maryland’s current public school funding formula. Then over the next decade, the court issued more opinions, saying that Baltimore students continued to be shortchanged. On Thursday, the American Civil Liberties Union of Maryland and the NAACP Legal Defense and Educational Fund filed a motion in Baltimore City Circuit Court to reopen that 1994 lawsuit. In the filing, they accuse Maryland of violating the state constitution by underfunding Baltimore City schools. Legislators in Annapolis will have their first chance to weigh in on recommendations by the Commission on Innovation and Excellence in Education — better known as the "Kirwan Commission" — which is studying ways to improve K-12 education in Maryland. A bill reflecting many of those recommendations is to go before a Senate committee Wednesday afternoon. Thousands of teachers, parents and students marched in Annapolis Monday night, seeking more funding for public schools. The march, which was organized by the Maryland State Education Association teachers union, culminated in the largest rally at the State House in recent memory. Organizers say 200 buses carried teachers from across the state, as far as Garrett County in Western Maryland, about three hours away. They estimate that there were about 8,500 people filling the streets, many of them wearing red beanies and carrying red cowbells and signs.